When I was growing up, my mom had her favorite "Did I ever tell you about . . . " stories. One of these was from when she was a student at the University of Nebraska. My mom is very petite and when she was a college student, she weighed a mere 100 pounds. Besides being a gymnastics teacher who was mistaken as one of the children one time (another favorite story of hers), her slight build also made her the perfect candidate for the coxswain of the school's rowing team. To this day, I don't know how long she was on the team or how many races she was in or even any of the names of the other rowers. I just know that it's something she took a certain amount of pride in. My dad was the first one to read this book, and you can probably already tell from the title and the cover, this is a story about rowing. Suddenly, his interest in my mom's college experience escalated. He began following her around the house, asking questions like, "As the coxswain, did you use a megaphone? Did you ask for an increased stroke count? Did you ever say, 'Give me ten big ones'?" My mom began to get a little annoyed. At that point, she had not read the book (although she has now), and I think she felt a little called out--her favorite story exposed! "No!" she'd reply. "Stop following me around! The University of Nebraska had a very small rowing program. We were not out to win any Olympic medals. I was usually so busy steering, I didn't have time for giving commands." But then she read the book. And the pride returned. Because even though Nebraska can't boast a competitive rowing program, she was the coxswain. And that's kind of a big deal, no matter the size or ability of the rowing program. 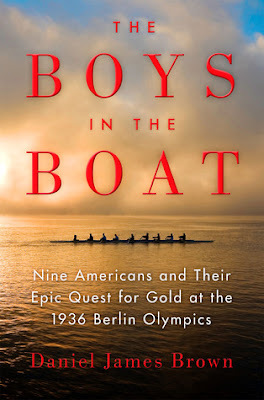 The Boys in the Boat is the true story of nine young men from The University of Washington who went to the Berlin Olympics in 1936, just as the world was on the cusp of the second world war. For the most part, they were boys from working class families. At the time, Washington felt far removed from the eastern United States where rowing was an esteemed and time-honored sport. But with the likes of Al Ulbrickson (Washington's coach), Tom Bolles (Washington's freshman coach), and Ky Ebright (California's coach and Washington's biggest rival), the western rowing teams became a force to be reckoned with. The story mainly follows Joe Rantz, who sat in the seventh seat of the Olympic boat. His childhood was not ideal. His mother died when he was only four years old, and he found himself shipped off to various relatives (including his older brother who had already graduated from college and was married). Eventually, his father remarried (to his son's wife's twin sister, believe it or not), and Joe moved back in with them. But Thula did not get along well with Joe (or really anyone, for that matter). The Rantz' life was hard: they lived in tiny cabins in rural towns and struggled to make ends meet. It was not the life that Thula, an accomplished violinist, had envisioned for herself, and she took out all of her frustrations on Joe. When he was just fifteen years old, Joe's father and Thula packed up once again, but this time they did not take Joe with them. Thula couldn't stand to be around him, and so she basically gave Joe's dad an ultimatum: her or him. He chose her (along with their four children), and Joe was abandoned and left on his own. His dad's parting words of advice were, "Look, Son, if there's one thing I've figured out about life, it's that if you want to be happy, you have to learn how to be happy on your own" (advice that, apparently, he himself did not follow since he was willing to let Thula dictate what he could or could not do). This was during the Depression when there really weren't jobs readily available, even for an industrious boy like Joe. He struggled just to have enough food to eat, and so it's pretty remarkable that just a few years later, he found himself at the University of Washington. He wanted a spot on the freshman rowing team, not because he had a particular affinity for rowing (he'd never even done it before), but because he wanted the guaranteed part-time job that would come with it. But once he was on the team, he held onto it for all that he was worth. He was determined to make it to the Olympics. I learned new vocabulary (for example, "catching a crab" doesn't really mean your oar caught a crab--just that it hit the water wrong), and I listened to the rundown of every race with bated breath. If anything, the credit for my sudden devotion to rowing probably goes to Daniel James Brown who has the remarkable ability of being able to tell a true story like it's fiction without actually fictionalizing any part of it. I couldn't believe how intense and suspenseful it was, even while knowing right from the beginning what the final outcome would be. As I was listening to the final Olympic race with full knowledge that they would come out on top, I still questioned myself. The details were so incredible, the odds against them so seemingly insurmountable, that I found myself thinking, Did I misunderstand? Did I miss something? I thought they were going to win! Because as they're in the middle of the race, rowing with all their might, it seems absolutely impossible that they could possibly end up winning. 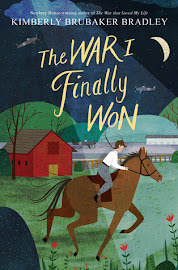 I'll refrain from sharing the details since I feel like, even knowing that they win, it would spoil it to tell you how it all happens, but I was truly amazed (and maybe even got a little teary-eyed). Even though the narration follows Joe Rantz (which provides some cohesion to the story as a whole), Brown fills in the gaps with all sorts of other interesting details: historical information (including some about the impending war), little glimpses of small-town life in rural America, and brief life sketches on the rest of the cast in this incredible story. One of the people you get to know is George Yeoman Pocock, Washington's resident boatbuilder. As a young man, he immigrated to the United States from England and began to build boats for a living (it's what his family was trained to do). By the time Joe Rantz came onto campus, Pocock was building all the boats for the western teams and for some of the eastern ones, too. He was a master craftsman. Quiet but observant, Pocock could give any of the famous fictional mentors a run for their money. He watches from the sidelines while polishing a hull here or shaving off a piece of wood there. At the critical moment, just as Joe is about to lose his chance of being on the Olympic team, Pocock takes him into his workshop and tells him to "think of a well-rowed race as a symphony, and himself as just one player in the orchestra." He says, "Joe, when you really start trusting those other boys, you will feel a power at work within you that is far beyond anything you've ever imagined. Sometimes, you will feel as if you have rowed right off the planet and are rowing among the stars." "From the moment he stepped into the shell that afternoon, [Joe] felt at home. He liked these boys. He didn't know Gordy Adam and Don Hume well, but both made a point of welcoming him aboard. His oldest, most reliable shell house friend, Roger Morris, sitting up front in the bow, gave him a wave and shouted the length of the boat, 'Hey, Joe, I see you finally found the right boat!' His buddies from Grand Coulee, Chuck Day and Johnny White, were sitting up near the front too. As he strapped his shoes to the footbaord and began to lace his feet into the shoes, Stub McMillin, his face alight, said, "OK, this boat is going to fly now, boys.' Shorty Hunt slapped him on the back and whispered, 'Got your back, Joe.'" That paragraph perfectly describes the camaraderie these boys felt with each other, but the reason why it's my very favorite scene is because you get the sense that Joe has finally found his place in the world with people who understand him, respect him, and even love him. (And I think the rest of the story attests to this bond because all nine of the boys kept in contact with each other throughout their lives, even decades and decades after that Olympic race.) It was just a very sweet, very emotional moment for me. This book's style reminded me a lot of Unbroken or Endurance. You might remember that when I read Endurance, I said I was going to buy it because I want my boys to have easy access to it during their teen years. This book is another one that I will buy for that same reason. 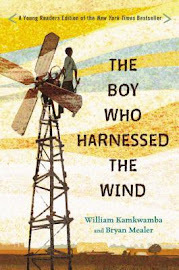 It is such a phenomenal story told in such an engaging way. Those nine boys, and particularly Joe Rantz, are exactly the kind of role models I want for my own boys: hard working, dedicated, and loyal. They went after the impossible, and they achieved it. Okay, and since we're on the subject of character and the kind of examples I want for my kids, I'm just going to give you one more glimpse at the kind of man Joe Rantz was. After he's been in school for about a year, Joe finds out that his father and stepmother have been living in a home not too far away from him. One afternoon, Joe and his girlfriend, Joyce, decide to pay them a visit. Thula is as prickly and cold-hearted as ever and tells him to "Make your own life, Joe. Stay out of ours." As they drive away, Joyce is furious (I could go on and on about Joyce--if Joe is the role model for my kids, then Joyce is the role model for me. She is absolutely incredible). She can't believe the way Thula treated Joe, and she can't figure out why Joe just quietly takes it. In frustration, she cries, "I just don't understand why you don't get angry." And Joe quietly replies, "It takes energy to get angry. It eats you up inside. I can't waste my energy like that and expect to get ahead." If my boys can read that and take it heart, they'll be well on their way to becoming fine young men. When we discussed this book at book club last month (one of my favorite discussions ever, by the way), it got a unanimous stamp of approval, but some people in the group said that it didn't quite meet their expectations (it is, after all, a book that has received a ton of praise in the last year) or that it dragged on endlessly in some parts. 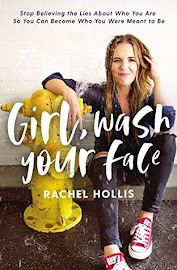 Although this was not my experience at all, I thought I'd mention it here with my own recommendation: I don't know if it would make a difference, but I listened to the audio, and it was brilliant. If there were slow parts, I honestly never noticed them. And the races! The races were especially exciting to listen to--almost like you were listening to the actual commentary over the radio. The actual book is still worth checking out because it includes some great photographs, but if you're a little worried about it dragging, I'd say give the audio a try. And as far as it being too hyped up, all I can tell you is that my expectations were high (since my dad, mom, and husband had all read it before me and couldn't stop praising it), and those expectations were still blown through the roof. They were met and exceeded in every possible way. I'm sure I've probably talked it up too much myself now, and you'll all be disappointed if you read it. But if you've read it, please tell me your experience with it. What did you like? What didn't you like? All right, this just got moved to the top of my "to-read" list. You're the 2nd person today who has recommended it very highly! Awesome! I can't wait for you to share your thoughts! Enjoy!!! Exactly my experience except that when I read it I had never heard of it before. I read it (not listened) and I never thought it dragged but I heard the same thing at my book club. The people who thought it dragged in places still loved it. I think some people just struggle with really long and descriptive books or they feel like some things aren't as important to the story. I loved all of the details about Joe's life as well as his teammates so this was not my experience. I also like detail when it is done well as it was in this book. When I finished this I seriously wanted to buy a rowing machine- it's still something I'd like to save up for. Can you imagine how amazing it would be to live somewhere that you could get up with the sunrise and row every morning?!?! Hmmm...well that debunks my theory! I loved all the details too--there are some authors that couldn't pull it off, but he did! Fun trivia -- my boys and niece are currently in a rowing camp at the Pocock Rowing Center, which traces itself back to that team! They tend to just row in the summers, so I doubt you'll see them following Joe's path to the Olympics, though. I didn't really think it dragged at all. However, I really like "slower" books with lots of character development, plot development, etc. In fact, I was surprised by how thrilling the book was! I was on the edge of my seat for almost every crew race. The author really did an excellent job providing details but also really providing a lot of suspense. Something rather hard to do in a non-fiction book, I feel. Me too! Every single race was exciting to me, and his descriptions were so vivid, I felt like I was watching them on TV!